The imposing ruins of Dunmore castle tower above the rolling fields of north Galway. Situated on a small hillock, the first castle at this site was built by the Anglo-Norman de-Birmingham family in the early 13th century. 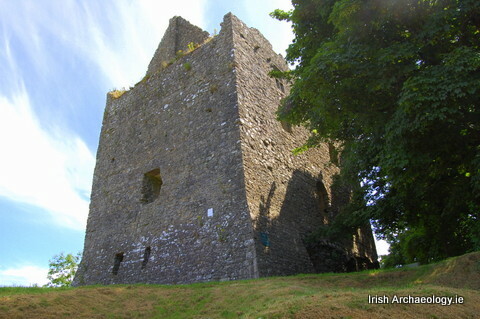 Designed as a bulwark against the native Irish, the castle was soon called into service. 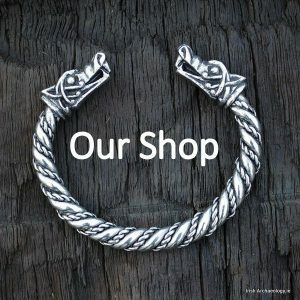 In 1249 Dunmore was attacked and burned by the O’Connor’s, while in 1284 it was besieged by the forces of Fichra O’ Flynn. 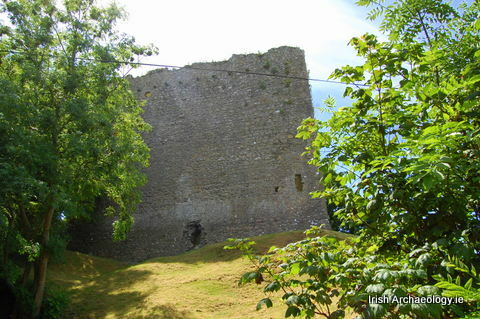 In 1315 it was once more the scene of conflict when an army, led by Rory Connor, attacked and damaged the fortress. After this last assault it appears the castle was largely rebuilt and much of the present day structure dates from the early 14th century. This building consisted of a two storey hall-keep, which was accessed via a first floor entrance. It was modified in the 16th century, when extra floors were added, along with roof gables, new chimneys, windows and ground floor entrance. The present castle, then, consists a large rectangular keep that measures approximately 14m in length by 8.20m in width. It stands five storeys high and the walls are defended by a substantial base batter. 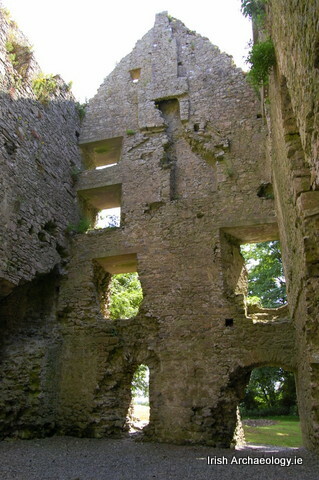 The original doorway into the castle was located at first floor level and was accessed by an external wooden stairway. This was replaced in the later middle ages by a ground level entrance and this now provides access to the structure. The much damaged remains of a mural staircase survives in the northeast corner of the castle, while there is evidence for a garderobe (toilet) at the northwest angle. The surviving windows include an oculus (circular window) in the northern wall, two mullioned windows in southern wall and a number of rectangular slits. 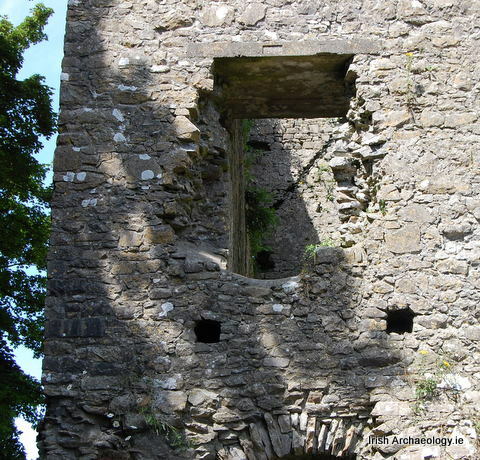 The castle was originally enclosed by an outer, curtain wall, fragments of which still survive. 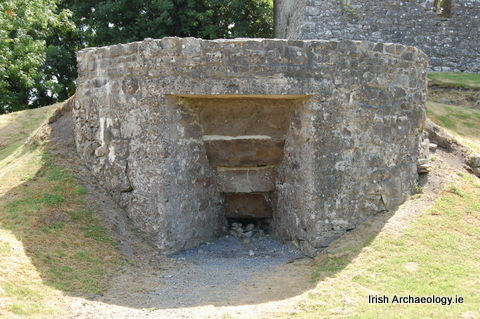 A much later, 19th century, limekiln also exists at the site. 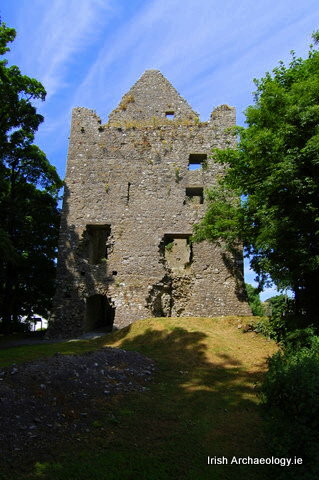 Dunmore castle is maintained by the OPW and is accessible to the general public. ← Thor’s Wood, a sacred grove near Viking Age Dublin? Home of the Ouseley’s until about 1750. See: Kelly, Richard J. (June 1910). “The Name and Familey of Ouseley”. 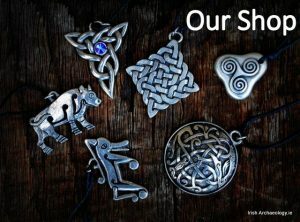 Royal Society of Antiquaries of Ireland. 5th Series 20 (2): 132–146.